Oh those busy little WikiTreers! 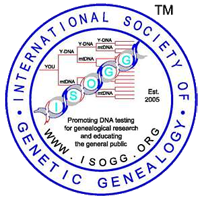 They have found a way to use the information input by WikiTreer Volunteers, WikiTreers, to show a listing of others on WikiTree, who have done YDNA and/or mtDNA testing and their shared Haplogroups. Here is the G2G (WikiTree Genealogist to Genealogist Forum) Post from Peter Roberts about it. This is no small task. considering getting volunteers to agree to and work collaborative on anything. Just Imagine trying to wrangle 348,649 people to do anything together. Now imagine getting 348,649 family historians, genealogists, genetic genealogists, history geeks, geneaDORKS (this title inspired by Thomas MacEntee), together to work on something so useful! It happens everyday on WikiTree. So what does this new little tweak to the big ole shared tree mean to me? I’ll tell ya. I followed the link to the Y-DNA list. When the page opened I clicked into my browsers “Find” function and searched my Dad’s, and many, many of western europes Haplogroup, R-M269 and up popped all the people on WikiTree who share that Haplogrpup with my Dad. I used my browsers find feature again and looked for my Surname – Gaulden. The list shoed my Dad and other spelling variants of Gaulden with “gaulden” as its root. I searched the other spelling variants, Gaulding, Golden, Goulding, Gauldin and others and found people on WikiTree that I didn’t know about who share my Dad’s DNA. NICE! So I did it again on the mtDNA list, with my mtDNA Haplogroup, and found only 12 people who match my specific Haplogroup, H1b1-T16362C. Not an incredibly common Haplogroup so only 12. But, 12! once again I didn’t know anything about the majority of these haplogroup matches on WikiTree until today! Grandma’s found some new clues to her family history/mysteries. Off I go to climb around the limbs of WikiTree to try and find some new cousins! Whee Doggie! Wow ! This is so helpful if I ever do the FamilyTree DNA. Hope we do and that you are the key to knocking down my Maternal brickwall – eternal optimist! Yes FTDNA My tree is on Geni. Next Next post: Source-A-Thon – October 1st & 2nd!